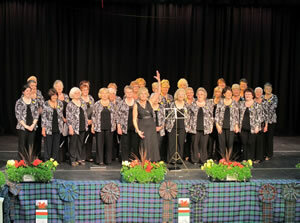 On Sunday 15 July 2012, together with the "Voices in Harmony" ladies choir from South Wales, the Choir performed a Grand Charity Concert in aid of Marie Curie Cancer Care. A large turnout enjoyed and greatly appreciated a tremendous concert of songs in English, Welsh and Gaelic, and music on the violin and the pipes and drums. Thanks are given to the local volunteers from Marie Curie Cancer Care and members of the Aberfeldy and District Inner Wheel who supported members of the Choir with the concert arrangements. Support was also given by the Rotary Club of Aberfeldy and District. 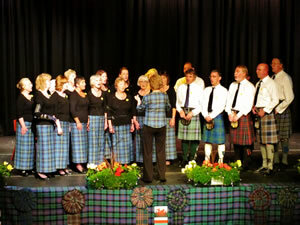 The concert, together with the prize draw, raised the fantastic sum of £1476.57 for Marie Curie Cancer Care.